Short-tailed Albatross breeding at Midway! The photo above is of a young bird, 1 or 2 years old. These all-dark immature birds are what we expect off the West Coast of North America. This is the 9th accepted Oregon record of a bird off Newport, Oregon on March 18, 2006. Photo by Troy Guy. Exciting news! A pair of Short-tailed Albatrosses is breeding on Midway Atoll! This is the first modern breeding record outside of Japan. The US Fish & Wildlife Service has had decoys up on Midway Atoll NWR and been playing Short-tailed Albatross calls for several years. A pair of Short-tailed Albatrosses has visited the island annually for 4 years, and this year started incubating an egg in November. Once numbering perhaps 5 million, these magnificent birds were killed on their nests and plucked and stuffed into pillows and mattresses until they were presumed extinct. In the first quarter of the 20th century perhaps only 10 pairs remained. 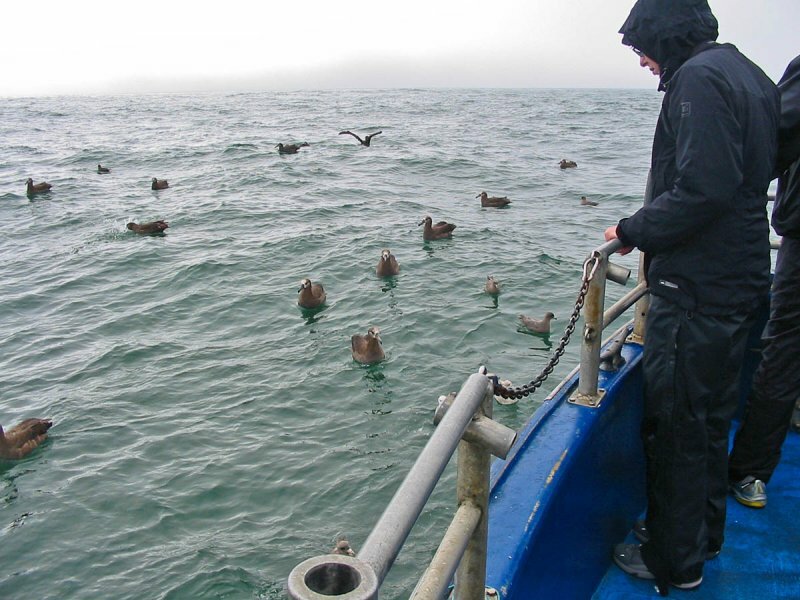 They have since recovered to some 2400 birds. Check out the news item and photos on the USFWS Flicker site. With the above news of breeding on Midway, perhaps we can expect to see more of these in the future. Of course, it will take decades to notice the increase from this site, and most of the birds will probably still forage north in the Aleutians. But there is every reason for long-term hope that these birds will continue to recover. We had a fun trip offshore from Newport this past Saturday. This was the final pelagic trip of the year. Highlights include a couple of ANCIENT MURRELETS nearshore on both outgoing and returning segments of our trip. For the second trip in a row, we've had FLESH-FOOTED SHEARWATERS come into our chum slick. On this day, one bird to each slick, about 15 miles (and over an hour) apart. Four SOUTH POLAR SKUAS and a flock of about 400 FORK-TAILED STORM-PETRELS were nice. We went on a Holland America cruise from Long Beach to Vancouver which included two days offshore. The sold-out ship was the 780-foot, 1,380-passenger MS Amsterdam. Seas were quite rough the first day, with 18-27 foot swells and 35+kt winds. Many on the ship were sick, but the birding, for those of us who were able, was wonderful. With the conditions and layout of the ship, our group-size worked well. It would have been difficult to find a calm viewpoint with many more people, though in calmer conditions it wouldn’t be an issue. Viewing was from 60-80 feet above sea level with binoculars and telescopes. We completed consecutive 20-minute surveys during daylight hours of the two days spent offshore. On Day One we were 30-45 miles offshore, from San Luis Obispo to Point Arena. On Day Two we were 30-60 miles offshore, from southern Oregon to the Olympic Peninsula in Washington. The transect data will be entered into eBird for anyone who is interested in more specific locations of the birds. Documentation of review species will be sent to the appropriate committees. 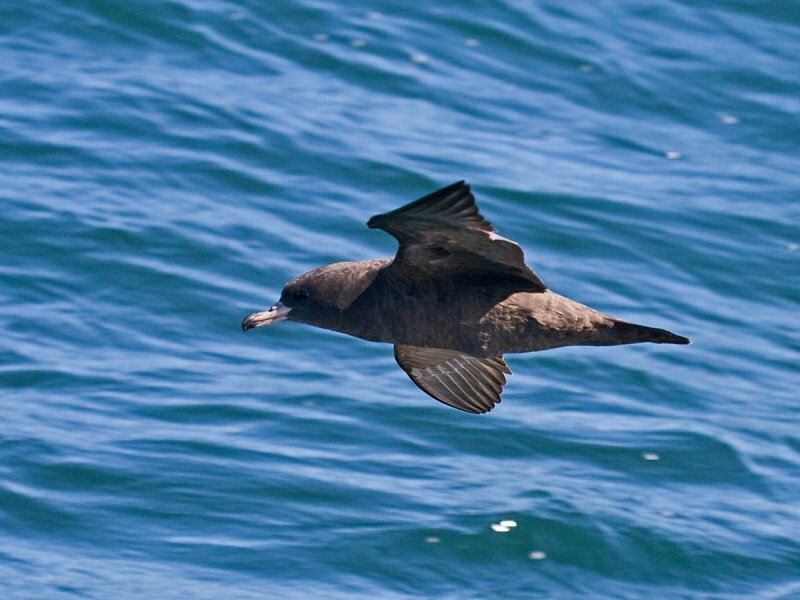 Murphy’s Petrel – 61 – mostly off OR but seen in all three states. They generally approached the ship more closely than the Cook’s Petrels did. The white chin was seen on many of them, as was the prominent M pattern on the back and the silvery under-wing flash that extended up the trailing edge of the wing toward the secondaries. Dark Pterodroma sp. – 10, two were not Murphy’s but neither was identified to species. One “menacing”, “big-boned” bird off CA we watched for 15+ seconds while it soared 60-100 feet above sea level, it was amazing to watch despite not knowing its identity, and the only bird we saw above the horizon line the entire first day. The other was off OR and bulkier than Murphy’s, but other than being quite dark, no plumage characteristics were seen despite watching for several arcs. Mottled Petrel – 2, Grays Harbor County, WA, Kevin, Todd & Adam saw. Cook’s Petrel – 232 – the first, last, and most abundant species of the first day. Seen on every twenty-minute transect! Hawaiian/Galapagos (Dark-rumped) Petrel – 2 – CA, one seen fairly well by all and identified as such in the field. The other was observed as a large white-bellied, dark-backed gadfly petrel – distant photos of it show coloration consistent with Hawaiian/Galapagos including dark cap and nape. The big mammal highlight was a group of six Baird’s Beaked Whales off Lincoln County, OR. 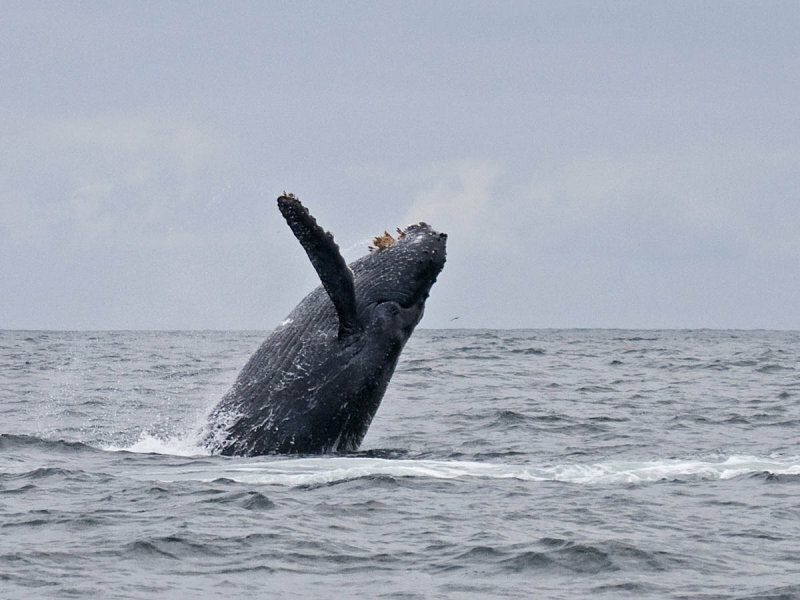 Other mammals include Fin Whale (OR), Sperm Whale (OR), Humpback Whale, Short-beaked Common Dolphin (near Long Beach), Dall’s Porpoise, Bottlenose Dolphin (Long Beach Harbor), Killer Whale, and Northern Fur Seal. 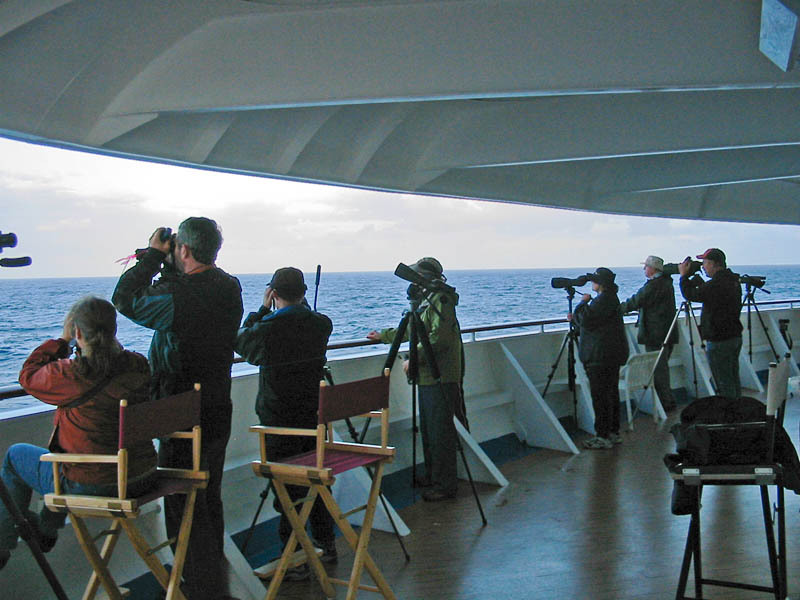 For several years now, a small group of birders has been taking cruise ships off the West Coast and watching some fantastic seabirds in comfort and luxury at a discount price. In summer the big cruise ships travel 8-14 days from Vancouver, British Columbia to Ketchikan and other Alaskan ports. In winter they cruise from Long Beach, California to the "Mexican Riviera" (Mazatlan and Puerto Villarta). These trips have all the amenities--shows, staterooms, food, drink, music, spas, art shows, fancy dinners--really, they are self-contained floating casinos. In spring, each boat must depart Long Beach and head to its new home in Vancouver. In the fall, the course is reversed. These repositioning cruises are 3-4 days and travel 60 miles offshore--the perfect place for deep water seabirding! The prices are exceptionally reasonable. In fact, the cost of such a trip (including air-fare) is often less than 3 day-long pelagic trips, when you figure in travel costs, restaurants, and a motel for 3 nights. If you choose your trip carefully, you can plan to be offshore during daylight hours nearly anywhere on the West Coast. Rise at dawn and have the ship to yourself for several hours, as the last late-night partiers are just stumbling off to bed. You watch birds generally from a covered deck on about the 7th floor of most ships. Bring your scope, it is smooth and the view is an ocean panorama (see photo above from September 2007). The very bow of the ship, from where you watch, may be more than a hundred feet forward of the bow wake, thus it is very quiet and relaxing. 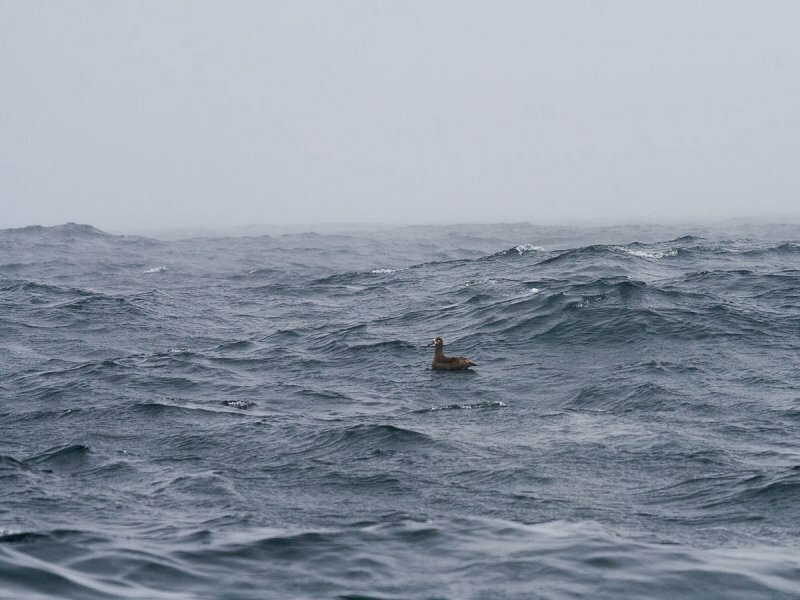 A lone Black-footed Albatross during a brief shower. Photo by Greg Gillson. Our Perpetua Bank pelagic trip went out in bumpy seas. Bird species were typical for the time of year. Highlights included 9 LONG-TAILED JAEGERS and a mother and calf HUMPBACK WHALE. The trip report is here. More trip photos are here. Additional photos from passenger Andy Hoffman are here. Success! 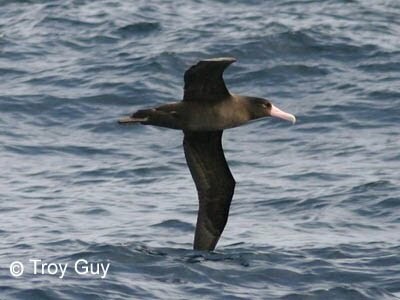 Our annual February/March "winter" Perpetua Bank trip was again successful at finding Laysan Albatrosses. This trip we had two different birds approach the boat, including at our chum stop, allowing for great views and photos. This trip in February or March is likely the most reliable in the continental US for finding Laysan Albatrosses on a single-day pelagic trip. In the past 11 winters we have had 9 of these Laysan Albatross search trips make it out. Of these, all but one trip located Laysan Albatrosses. These are also great trips for seeing Black-legged Kittiwakes, Thayer's Gulls, and Rhinoceros Auklets. 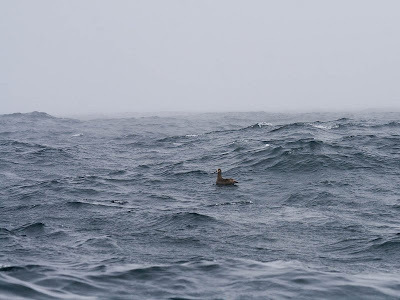 Short-tailed Shearwaters and Ancient Murrelets are usually spotted, but don't always give good views. Other photos from this trip are here. Seabird enthusiasts are sure to find an article published in October 2009 very interesting. The complete article on the web is entitled: "From the Eye of the Albatross: a Bird-Borne Camera Shows an Association between Albatrosses and a Killer Whale in the Southern Ocean. Figure 1 shows several photographs from the camera attached to this Black-browed Albatross showing it following behind other albatrosses in flight, an encounter with a Killer Whale, approaching a fishing vessel, and flying near an iceberg. Perhaps missed in the excitement of the Coos Bay Brown Booby from October 28 to November 28+, was another report of Brown Booby in November. Phil Pickering did a seawatch on a blustery day at Boiler Bay, about 100 miles north of Coos Bay. While the Coos Bay Brown Booby was still being reported there, Phil spotted another female-plumaged Brown Booby on November 22, 2009 from Boiler Bay. "Seen briefly in front of squall <1/2 mile at ~9:20, drifting slowly S 40-50 feet above the water over a small feeding group of Pelicans/gulls. Recognized immediately by unmistakable shape - 2/3 size of Pelican with long comparatively slender body, long neck, long evenly tapered bill, and very long obviously wedge-shaped dark tail. Upperparts entirely dark brown, belly white, complete solidly dark brown hood extending to lower breast, sharply delineated from white belly. Underwing/bill color didn't register." 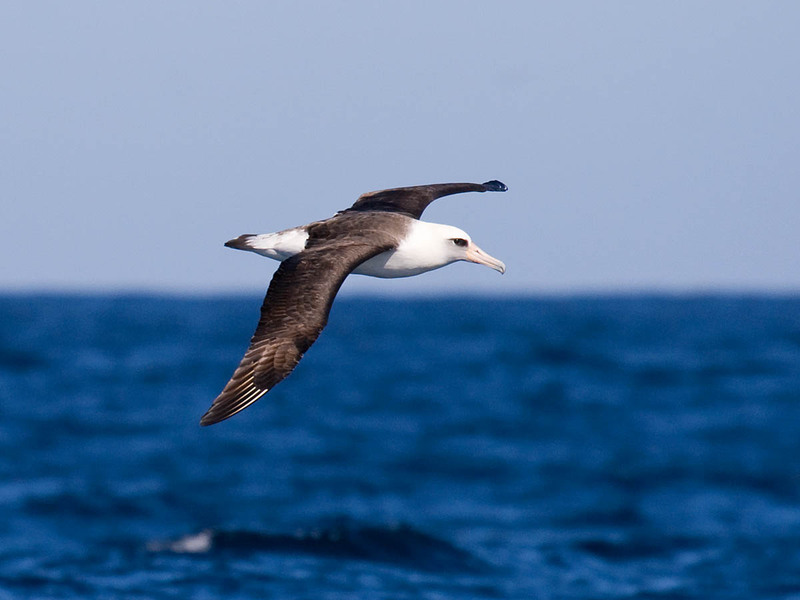 Amazingly, during this same seawatch, a Laysan Albatross also soared by about 1 mile offshore. This is species is rarely reported from shore. A Rock Sandpiper poses for photos on a barnacle-encrusted jetty rock at Tillamook's Barview Jetty. Photo 17 January 2009 by Greg Gillson. One highly sought after bird on the Oregon coast is Rock Sandpiper. "Is it too early to see one?" is a question I hear from many fall pelagic participants. Rock Sandpipers have been recorded as early as late August. The latest departure date has been mid May. So, no, it's not too early in August or September. It's just not likely. Most birds are found along the Oregon coast from late October into March. Habitat requirements are fairly stringent and not always safely birded. 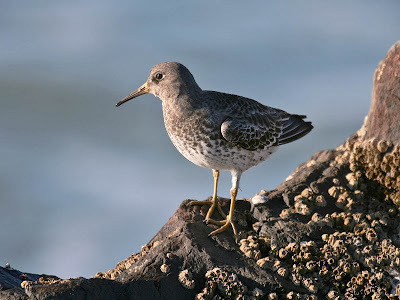 This slate-colored bird works the rocky intertidal zone, blending in with its habitat inches above the crashing surf. On the central Oregon coast is perhaps one of the more reliable places to find this bird, just 10 miles south of Newport at Seal Rock State Wayside. The best place to try is 1/4 mile south of the park entrance at a pullout overlooking some large rocks at the end of the beach. This area is best at high tide, when the rocks farther offshore are submerged and the birds are forced closer to shore. It is possible for the agile to clamber down the rocks to the beach, but this is not recommended--especially if the rocks are wet. Another place to look is on the north coast at Barview Jetty, the north jetty of Tillamook Bay. Drive through Barview Jetty Park (no fee needed). The jetty at low tide is sometimes navigable for a ways. Again, the footing on wet rocks is treacherous. Sneaker waves could sweep across the jetty at any time. If seas are particularly rough, the birds may actually be up the bay slightly, near the Coast Guard tower. The bird photographed above was located as indicated on the map below. There are two strategies to use to see these birds. First, they often loosely associate with flocks of Surfbirds and Black Turnstones. Watch for them to all fly out occasionally as they are wont to do. Then look for the smaller Dunlin-like bird flying out with them. Secondly, scan along with the incoming waves. These birds feed right along the waterline and the waves often flush them a few feet up the jetty rocks before the wave passes and they scurry down again.